The next film in the snowy Saturday binge watch is a silly, downright dumb, film from 1987 that, for whatever reason, I enjoy. The Monster Squad is a group of children facing off against the iconic monsters of all-time in Dracula, Frankenstein’s Monster, the Wolfman, the Creature and the Mummy. 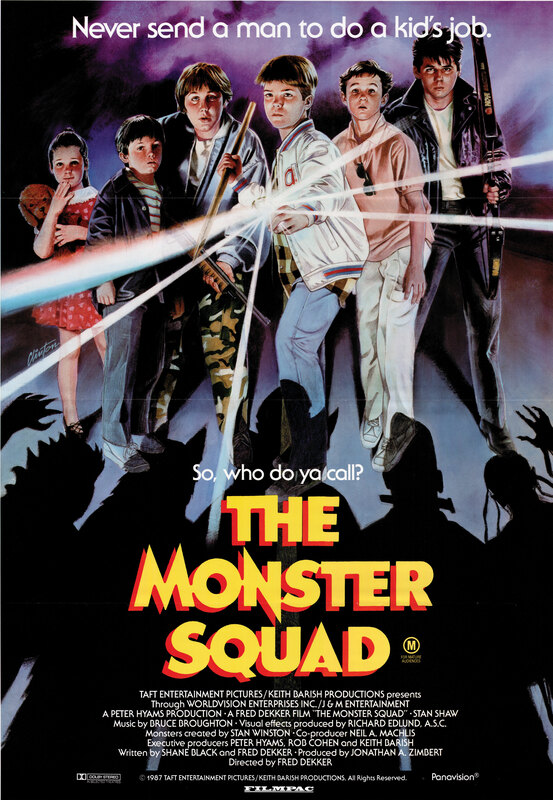 The Monster Squad is pure 1980s goodness. It is like the Goonies blended with Ghostbusters in a B-movie extravaganza. Is is stupid? Sure. Does it have major holes? Yep. Does it work in today’s world? Not so much. Still, I cannot say that I don’t enjoy watching it every time it is on. As I am watching the film, I am amazed at the small moments of depth that the film tries to sneak into the film. Scary German Guy has a tattoo from a concentration camp on his forearm that we see after one of the kids say that he really knows about monsters. When Rudy shoots the Wolfman, you can see the conflict within the boy’s face. Whether intended or not, you can see he was shaken by his killing of the Wolfman. The realization by Frankenstein’s Monster that he was an ugly creature and how that bothered him was surprisingly effective. Sean later insists that they do not call Frankenstein’s Monster a monster, referring to him as Frank instead. All of these moments were enjoyable and brought more to the story than just the silliness of the plot. Now, there were a lot of things that would be frowned upon today. Like, for example, how Rudy blackmails Patrick’s sister into helping them by taking pictures of her partially naked and threatening to post them at school. Not cool, Rudy. And… why did this group of boys desperately need to find a virgin to perform the ritual so badly? I mean, they are in a monster club. All of these boys were all certainly virgins. Pretty sexist when you indicate that your virgin has to be the girl. Shane Black, yes that one, wrote the script for The Monster Squad along with director Fred Dekker. They weaved several hints and homages to the original Universal monsters of the old days of film in their script. There is little wasted time here as the film moves quickly from intro of the monsters to the final struggle with the kids. The kids do a good job of getting you invested in them and being cute.